Fall has arrived and i can't believe we still have that warm summery weather over here and it seems this last week of september won't disappoint too. I have always loved the month of september and the transition from summer to fall when farmers market is at its peak. I know,it's not fair to talk about fall and publish a chocolate cake. I should make a pie and welcoming fall season like everyone does at this time of the year but i owe you this recipe,guys!! Now,let me tell you about this cake and how delightful it is. 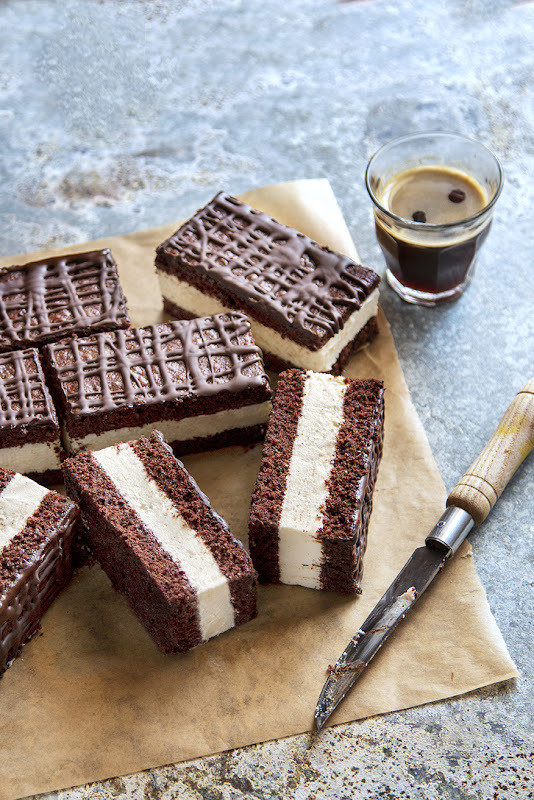 I think everyone heard about kinder milk slice aka chocolate sandwich ,a german snack consisting of two layers of chocolate sponge cake with a milky filling. If you have kids you've probably already introduced them to it,it's not a healthy option but actually kids were the target when the company has launched the product. Unfortunately,i don't have a healthy version either 😏so this cake is suitable for adults only. 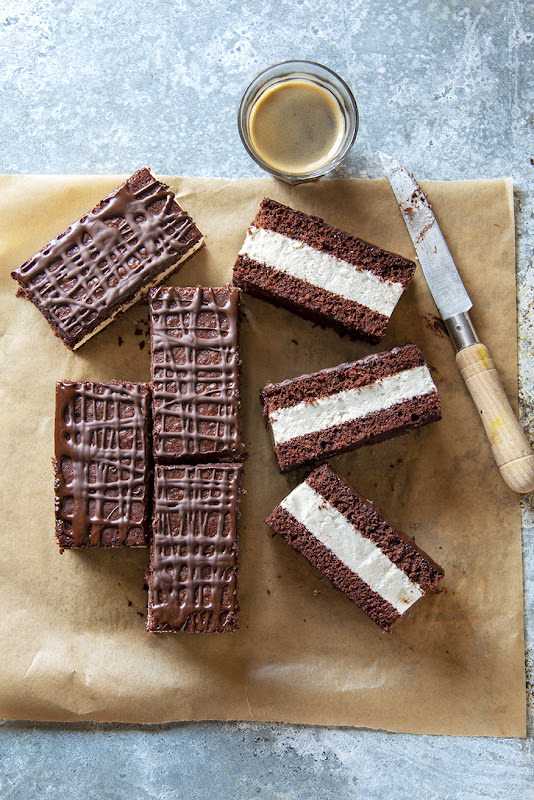 I used to regularly buy the kinder chocolate milk slices and always had a couple in my pantry just for those moments when i had chocolate cravings but wasn't in the mood for baking. Then i discovered that homemade version is even better than store-bought ones and never wanted to buy them again. And why should i buy them again once my own version came out exactly as i wanted, moist and creamy plus was super easy to put together! Even you're not a chocolate lover you're gonna love this cake! Line with parchment paper a 37cm x 25cm diameter baking tray.This measurement refers to the inside diameter of the tray. Place eggs in a large,clean bowl and with your mixer at high speed start to whisk adding sugar gradually.Whisk until mixture becomes thick, fluffy, and doubles in volume. Reduce the mixer speed to medium and slowly add sunflower oil.Whisk until just combined. Sift the flour and cocoa powder on top of the egg mixture,a little at a time, and fold it gently using a silicone spatula. Pour the batter into the prepared pan,spread it evenly with an offset spatula and bake at 175ºC /345ºF for 15 minutes. When the timer goes off, turn the oven off and remove the pan from the oven.Place the pan in a cool airy space for about 20-25 minutes. Once the cake has cooled start to make the filling. Soak gelatine sheets in a bowl of cold water for about10 minutes.Make sure all gelatine sheets are submerged in water. Place mascarpone cheese and condensed milk in a large bowl and using an electric mixer whisk until smooth.Set aside. In another bowl whip the cream until stiff peaks form. Add the cream to cheese mixture and whisk briefly just until they are combined. Remove gelatine sheets from the water and gently squeeze out all the excess water. Put gelatine into a small saucepan,add 4 tbsp milk and place the saucepan over a low heat.Heat the mixture, stirring until the gelatine is dissolved for about 20-30 seconds.Set aside to cool slightly. Put the gelatine and 3 tablespoons of water into a small bowl.Stir to combine and set aside for 10 minutes. After that time,pour 4 tbsp of hot milk over soaked gelatine and place the bowl in a small saucepan of barely simmering water, stirring until gelatine dissolves. Allow to cool slightly before adding to the filling. Remove filling from the fridge. Line the pan with parchment paper and place first layer of cake on the bottom of the pan. Spoon filling onto the center of the cake and with an offset spatula spread the mixture evenly,pushing it towards the edges. Place the second cake layer on top and press gently to make sure it sticks. Cover the pan with cling film and refrigerate for least 6 hours. Place a sheet of parchment paper onto a wooden board. Put the first layer of the cake on the paper. 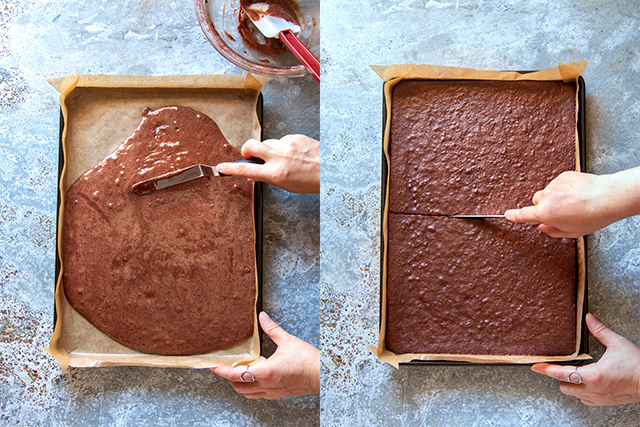 If some filling comes out the sides,use a spatula to smooth the sides of the cake. Refrigerate for least 6 hours. 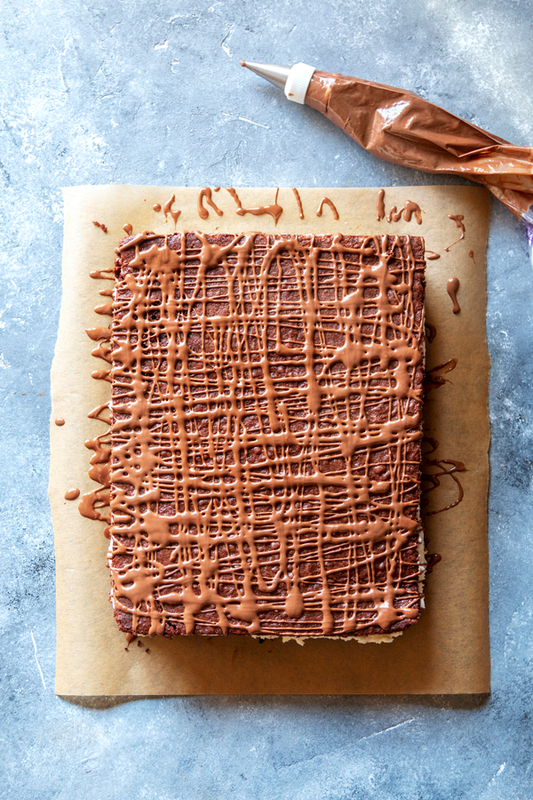 Drizzle with melted chocolate and cut into rectangles before serving. Store leftoves in the fridge, in an airtight container. Gosto da tua nova imagem, Vi querida. Aww,muito obrigada Claudia! Agradeço a tua opinião!! Espero que esteja tudo bem contigo,já não falamos há algum tempo!